Pestos are really easy to make and I always enjoy playing around with different flavours. 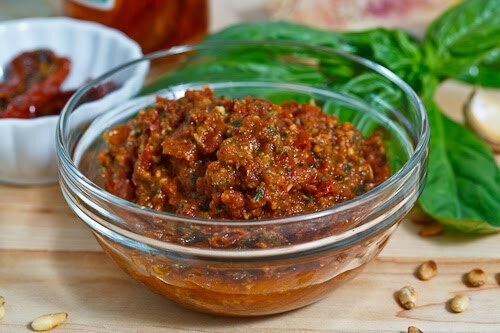 One of my favorite pestos is this sundried tomato pesto which is as easy to make as throwing everything into a food processor and pureeing. In addition to being super simple to make this pesto is just packed with flavour! I like using pestos like this in pasta or as a condiment in sandwiches. A splendid pesto with a lot of oomph! looks delish–i bet it would be good with a little oregano too. This is a beautiful pesto and I could see it going well with almost everything. What a wonderful pesto! Congratulations for your blog full of great recipes. This pesto looks fantastic! I'll definitely have to make some of that… I know my hubby would love it. Mmmm, does this ever look good. This sounds like a great recipe. I'm going to have to bookmark it and try it soon. Yup, making this one too. We put it on grilled chicken breasts with a slice of swiss cheese. Grill the chicken and put on the toppings a couple of minutes before they're done, enough to heat through everything and melt the cheese. Big party hit! Anonymous: Yes you can use dried sundries tomatoes, just soak them in warm water until tender,about 20-30 minutes. Anonymous: Now that is a tasty way to use some of this pesto! Glad you enjoyed it! Can u use pumpkin seeds instead of pinenuts? Anonymous: Pumpkin seeds definitely work in pestos like this, though they will change the flavour profile a bit. Made this today – delicious! I made it using sun dried tomatoes that weren't packed in oil. They were soft, so I didn't need to reconstitute them. Kevin: Nice recipe, but the content suffers from apostrophe abuse. The plural form of pesto should be pestos. You incorrectly use the possessive form (pesto's) several times. Thanks for this recipe. Makes a really nice pesto. I substitute dried basil because I always have that in the cupboard and it comes out great.